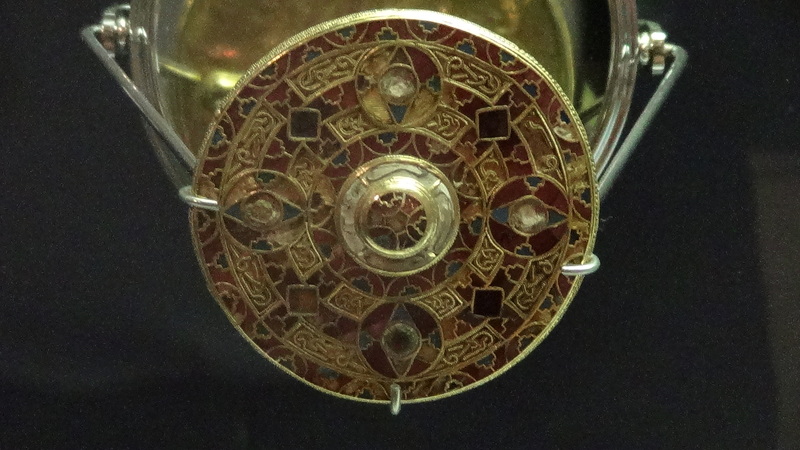 The Kingston Down brooch dates from between 600 to 625 A.D. This is one of the finest Anglo-Saxon brooches ever discovered and contains over 830 pieces of metal together with garnets, blue glass and Pearl inlay on a gold framework. It has been suggested that it may well have come from the same workshop as the finds discovered at Sutton Hoo in Essex. However despite it’s finery this was not just a display item and the wear pattern suggests it was quite regularly used and had been repaired a number of times. It was discovered at Kingston Down in Kent by Brian Fausett in 1771 and was offered the British Museum, following his death, in 1853. Amazingly, the British Museum declined the offer, apparently because at that time it had no interest in British history! A few years later it was purchased by Joseph Mayo and presented to Liverpool Museum where it can be seen today.